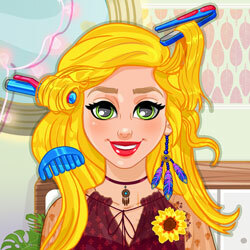 Description: Natalie decided that she wants a cool new look. Discover more about the Boho Style and surprise Natalie with your hairstyling skills. Try some creative ideas, cutting her hair, coloring it, straightening it or curlying it. After that you can choose Natalie's outfit and some perfect accessories to go with her awesome new hairstyle.